During the Spring of Culture, Lena W Dajani, an artist and my friend, is having her first solo exhibit at World Beat Fitness starting March 2, 2013. Karibu Tanzania is Swahili for “Welcome to Tanzania”. 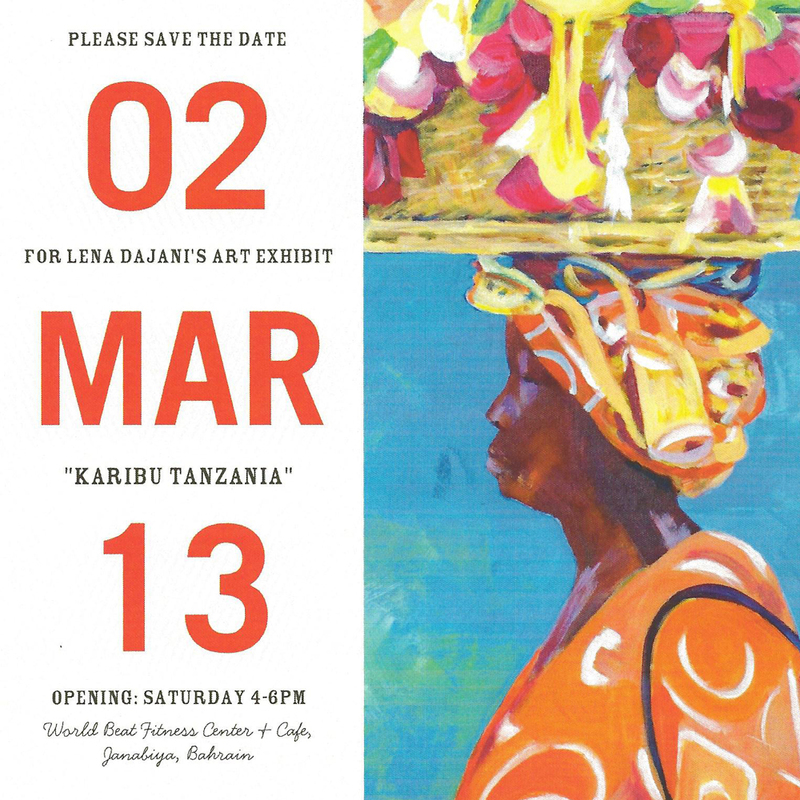 The beauty of Tanzania’s vibrant landscapes and people are the subject of Lena’s first solo exhibit. Between 2008 –2010, Lena and her family lived in Dar Es Salam. She immediately fell in love with the city, its idyllic setting on the Indian Ocean and tropical landscape. From Dar Es Salaam, the family explored the shores of Zanzibar, sailed the Indian Ocean, and took numerous safari trips to the country’s national parks. Traveling through the Ngorongoro Crater, Manyara, Serengeti, Amani, Saadani, Bongoyo, Mbudya and Ruaha reserves, she captured the family adventures. This exhibit was created from her thousands of photos. Lena was a member of Artist Seana Mallen’s Awali Arts. Under Seana’s artistic guidance, her painting developed from a hobby to a commitment to create unique artwork drawing from her global experiences. A busy mother, she currently works with watercolor and acrylic painting that allows her to quickly and effectively re-create and capture her impressions. Private collectors in Bahrain, Saudi Arabia, Jordan and Tanzania have purchased Lena’s paintings. She created a line of greeting cards and has presented her art work in several local exhibitions. 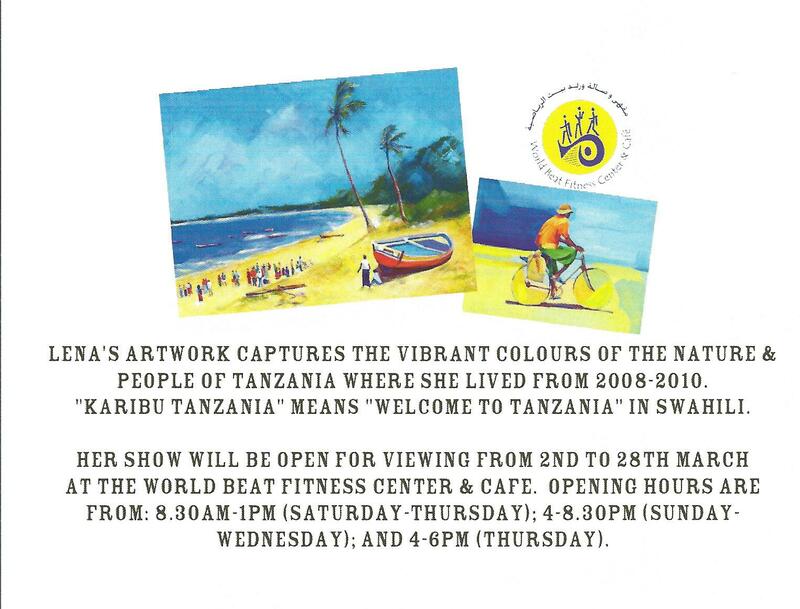 Karibu Tanzania will continue through March at World Beat. However, if you can, on the opening day, stop by to meet and chat with Lena. Her conversations range from Islamic art, Edward Tingatinga’s paintings, African safaris, Bali artists, high-tea in London, camping trips in Oman, Middle East politics, recipes from Gourmet magazine or family tennis tournaments in the south of France. Her passport may say American, but she is a true Global Citizen and her art is inspired by global culture. You can LIKE Lena on FACEBOOK. Eco-tourism is a popular travel option now. But one area I feel the eco-tour operators fail to educate their customers about is water and toilets. Developing countries rely on cash-rich tourists to visit. But to create an infrastructure that will support large numbers of tourists, finite resources such as water are shifted away from the local population to appease the nearly insatiable tourist palate. To me paper towels meant the heavy type used in the kitchen or to dry your hands. I did not realize the owners were talking about toilet paper, or toilet tissue, or Kleenex or whatever else you might call paper used to wipe our bottoms. It was after the Sewerage Truck backed into our driveway and began to pump out our villa’s septic tank that I began to understand the bigger issue – we live in a desert. Water is scarce. 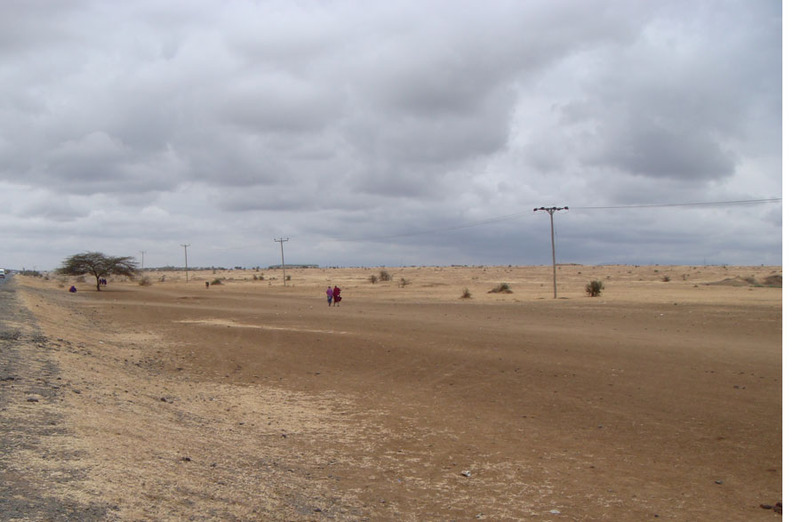 In Tanzania where we took sneaky snapshots of tall Masai herding their boney cattle across the nearly desert landscape, their lack of water hardly affected us. We could pay for airlifted bottles of water ported in our van’s cooler and flushing toilets in air conditioned guest rooms. The Masai’s daily search for water never touched our experience. 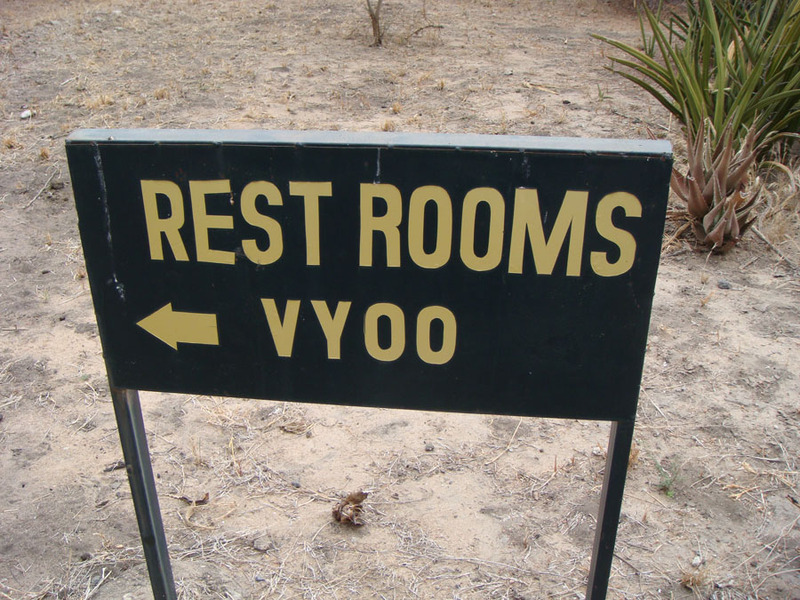 At the Tarangire Game Reserve I popped into the government supported latrine before we embarked on our four hour safari. A busload of American tourists followed me. The modern, made-for-tourist bathrooms had several stalls, sinks, and mirrors. The toilets had just enough water to clear the bowl. Coming from America where we reclaim toilet water making it drinkable again, the idea had never crossed their minds. “Thanks for telling us,” one woman said genuinely grateful. Because when I see a clean toilet bowl clogged up by a mass of toilet paper, I realize another uneducated Westerner has been there. Is it necessary to flush the toilet after a pee? And why throw masses of toilet paper in the bowl? It takes two or three flushes to clear the paper and taxes the septic system. Unlike the West where we are unaccustomed to using bidets, I believe the Arabs and the Indians wash with the water hose next to the toilets. Then they use a small amount of paper to dry themselves and throw that in the trash bin next to the toilet. I am uncertain what the best method is, but in desert countries like Bahrain where water reclamation does not exist and 98% of the sewage is pumped just offshore into the ocean, introducing less garbage into the water system seems like the best solution. National Geographic did a great story on “Water: Our Thirsty World” in April 2010.